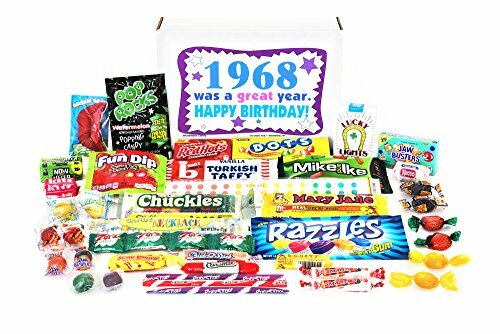 Woodstock Candy 1968 50th Birthday Gift Box - Nostalgic Retro Candy Mix from Childhood for 50 Year Old Man or Woman Jr. The year of 1968 had a lot of memorable moments in pop culture: The first Big Mac was sold at McDonald's, The Beatles released the "White Album," and the top movie of the year was 2001: A Space Odyssey. You can put anyone born that year in a time machine with great candy memories. This unique birthday present includes retro candy popular when a 50 year old was a kid. Sour and sweet, the birthday guy or gal will have plenty to treat their sweet tooth to as they fondly recall childhood sugar rushes. Not easily found in grocery stores or shops today, this vintage candy mix is a thoughtful and uncommon gift with a personal touch. Candy box includes: Atomic Fireballs, Bonomo Turkish Taffy, Dots, Chuckles, Mike and Ike, Red Hots, Jawbusters, Pop Rocks, Razzles, Mary Janes, Fun Dip, Kits, Pixy Stix, Candy Necklace, Sugar Daddy Jr., Wax Lips, Candy Buttons on Paper, Zotz, Chick-O-Stick, Lemonheads, Butterscotch Buttons, Necco Wafers, Now and Later, Candy Cigarettes, Root Beer Barrels, Jawbreakers, Smarties, Sour Balls, BB Bat, Strawberry Drops, and Classic Caramel. On occasion, we may substitute an out of stock item with candy of the same value. Box measures 9.5 x 7 x 3 inches and comes shrink-wrapped. If you have any questions about this product by Woodstock Candy, contact us by completing and submitting the form below. If you are looking for a specif part number, please include it with your message. Complete Birthday Gift Basket Box for Her-Women, Mom, Aunt, Sister or Friend, Unique! By Hey, It's Your Day Gift Box Co.